'Sedona Serenity' is furnished with original art and antiques, fine linens, and inspiring books, music and movies. Nature and nurture for body and spirit. It is a peaceful retreat at Red Rock Crossing. There is a private garden hot tub to relax in. The large master suite includes a luxurious bath with claw foot tub and custom glass shower. Cozy living room has futon sleeper sofa. Gourmet kitchen encourages the creativity of your 'inner chef'. A small office includes antique desk and dependable wifi. The lush back yard invites al-fresco garden dining, and includes a gas grill. Tranquil meditation areas abound. You are just a short walk away from 2 renowned spiritual centers (Dr. David Hawkins and Course in Miracles Community House). Cathedral Rock, Buddha Beach, and Pyramid Peak just a few steps away. In addition, world class hiking and biking are at your doorstep. I always dreamed of owning a B&B, and love to create comfortable living space. Sharing the casita with visitors is a dream come true for me. This property is the most nurturing, peaceful place I've ever lived. It has a rural feeling, and is great for nature-lovers. The lane is so welcoming...it feels like a perpetual summer vacation, as I walk down the neighborhood trail to the creek, greeting the neighbors. In a peaceful neighborhood just outside the city limits. Unlimited US long distance land-line. Always high quality 100% cotton. Numerous peaceful patio/ garden seating areas. Available for additional charge of $10. night. Private Garden Setting. You must let me know if you desire this. Business ready with dependable wi-fi and house telephone. The casita is cosy and comfortable and just walking distance from the Red Rock Crossing Crescent Moon park where the most fantastic views of majestic Cathedral Rock can be found. The location is awesome for access to Sedona. Our stay at Sedona Serenity was everything we hoped it would be. It was the perfect size for the two of us and our two small dogs. We loved the location on the west side of Sedona, away from the busier side of town, but only minutes away from restaurants, grocery stores and other businesses. The drive to and from the casita was breathtaking with plenty of places to pull over and take in the views. We were close enough to walk to the Cathedral Rock Vortex and there are many other nearby trails to hike. The casita itself is very comfortable with a well equipped kitchen and a very nice shower as well as a private yard to relax in. It also has a nice gas grill which we used several times, a large hot tub and a washer and dryer which comes in very handy for those extended stays. Linda is an excellent host and is there if needed. Otherwise she just lets you have your privacy. We look forward to coming back and staying here again. Thank you for taking time to write a review, (and confirm that I'm "on the right track" doing what my heart loves). It was such a pleasure to meet you and your "fur babies." I look forward to welcoming you year after year. Great place to stay and relax. Close enough to town to enjoy it but also far enough to avoid the crowds. We loved the place and want to come back in summer! We loved the casita. The backyard is gorgeous, private, and cozy. The shower is great. Bedroom very romantic. Lovely kitchen. It was nice to have a washer and dryer. Loved our week long stay here. Quiet, comfortable and thoughtfully outfitted with everything you might need. 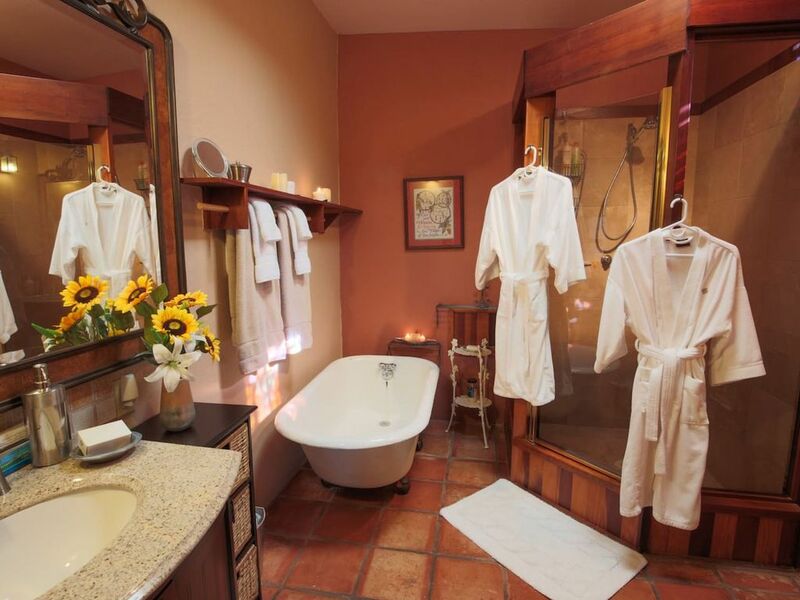 West Sedona location is ideal. Hope to return some day! Wonderful location!. Park down the street, clean hot tub. Wonderful kitchen. Everything was beyond our expectations. Linda is wonderful to work with and very responsive. I have never been to Sedona, I will return. It is now in my heart. Just to clarify: the "Park down the street" refers to Red Rock Crossing/Crescent Moon Recreation Area. There is off street car parking right in front of the Casita. I love welcoming repeat guests and look forward to seeing you again soon. Just 3 blocks from Red Rock Crossing via a neighborhood path.